"heyy can u make a tutorial for pink silver and black smokey eye makeup plzzzzz i have an upcoming graduation party and i will be wearing a pink colour gown which has white pearls on it and can't decide the make up. can you plzzz help? " If you wish you play safe with eyeshadows you honestly don't have many oprions with silver and pink, so for this looks i kept the silver and pink understated and did some heavy smoked out liner on both upper and lower lashline. Here is the look i cam up with.. 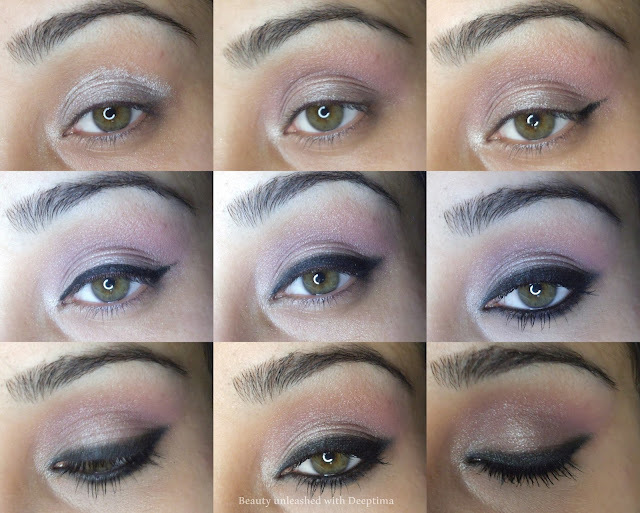 I primed my lids to make the light pink and silver pop out and to increase their staying power. I preferred the heavy liner for this look to bring attention to the eyes without making the eyemakeup look completely matching-matching with the dress. More over when you'll open your eyes with this makeup all you would see is smudged smokey liner with pink in the crease and the hint of silver would be visible when you look down or blink your eyes, making them even more appealing.